We’d love your help. 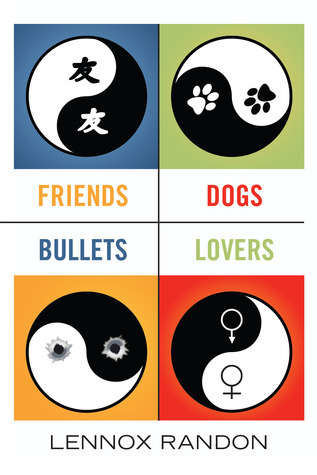 Let us know what’s wrong with this preview of Friends Dogs Bullets Lovers by Lennox Randon. To ask other readers questions about Friends Dogs Bullets Lovers, please sign up. FRIENDS DOGS BULLETS LOVERS is an excellent read. The writing is witty, the plot, solid and the characters, memorable. FRIENDS, Noah & Lee, are unwittingly thrust into the Witness Protection Program and are forced to relocate from Iowa to Texas where they await the arrival of their DOGS, have to fend themselves from the BULLETS of the mobsters who seek their demise and along the way find LOVERS who help make it all worthwhile. First time novelist, Lennox Randon, himself an ex-policeman, supp FRIENDS DOGS BULLETS LOVERS is an excellent read. The writing is witty, the plot, solid and the characters, memorable. FRIENDS, Noah & Lee, are unwittingly thrust into the Witness Protection Program and are forced to relocate from Iowa to Texas where they await the arrival of their DOGS, have to fend themselves from the BULLETS of the mobsters who seek their demise and along the way find LOVERS who help make it all worthwhile. First time novelist, Lennox Randon, himself an ex-policeman, supplies a lot of good police action detail wrapped up in a humourous presentation that has the power to make you think. Good combination: laughing, thinking and sitting on pins and needles anticipating where the action is going to take you. I heard Lennox speak at my local Rotary club a month or so ago. I bought his book, and just read it this past week. I started it on a trip to Seattle, and couldn't put it down. In fact, I finished it in two days! I really enjoyed the characters and some of the unexpected twists in the relationships. Funny and capitivating. The title made me inquisitive about the novel. But once into it, I understood completely. Well written and good story line. A must read. This novel begins quickly as two, long-time friends take their dogs out for a walk and apprehend a pair of serious criminals. As a result of their success, these two single guys must now try to reinvent themselves in a new city and end up finding out that it’s hard to let go of their past. It’s a great story that I found both intriguing and humorous. Noah and Lee have been friends since they were young. As they take their dogs out for a run in Maquoketa State Park, they run into some trouble. Th This novel begins quickly as two, long-time friends take their dogs out for a walk and apprehend a pair of serious criminals. As a result of their success, these two single guys must now try to reinvent themselves in a new city and end up finding out that it’s hard to let go of their past. It’s a great story that I found both intriguing and humorous. Noah and Lee have been friends since they were young. As they take their dogs out for a run in Maquoketa State Park, they run into some trouble. The two friends locate and apprehend the suspects after gunshots were exchanged, following a confrontation. The police make the arrest and after Noah and Lee have made their statements, the two friends are placed in the Witness Protection Program. No longer in Iowa, the two are moved to Texas, where eventually they are reunited with their dogs. In the Witness Protection Program, the two friends must make an overhaul of themselves: changing their appearances, their jobs, and they must not reference their previous lives. Easier said than done, with these two. Noah used to be on the police force and this will always run through his blood. His first job doesn’t go so well and being in a new community is hard for him. Lee on the other hand is a flirt, he is all over the place. His “I know a guy” stories, allow him to talk about their previous lives with anyone. These talks also get the two of them into a secret of line of business that the Witness Protection Program is unaware of. Instead of laying low and keeping quiet, the two of them seem to be out in the open a lot, which gets them in trouble with their contact in the Program. They both are single so I anticipated some dating to occur in the book, which did happen. It was interesting how the two friends handled this, as they were not supposed to reveal their past to anyone. I liked the quick pace of the book and I liked the characters. I liked how the characters fed off each other and their light-heartedness. I enjoyed the struggles they had trying to remain under the radar and their business venture together was entertaining. This novel wasn’t deep, it was a light and fun novel to read. I was glad our book club read this novel as I don’t think I would have picked it up otherwise. Lennox Randon is a graduate of the Houston Police Academy and The University of Texas at Austin with a B.S. in Education. He has worked as a police officer, technical writer, and teacher. As of this writing, he is living with metastatic GIST cancer and promoting his historical fiction novel, Memoirs of a Dead White Chick. Randon currently lives in Iowa with his wife Lileah. His website, including mus Lennox Randon is a graduate of the Houston Police Academy and The University of Texas at Austin with a B.S. in Education. He has worked as a police officer, technical writer, and teacher.